Like Merchant Ships: Out, Out, Brown Post! 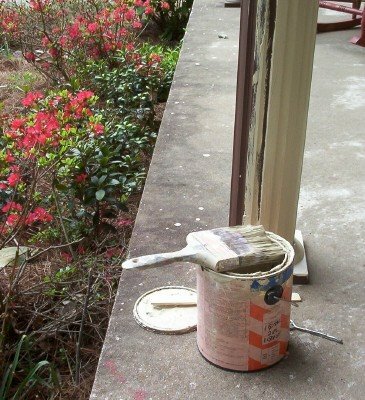 I painted the porch columns beige. We were hoping to box around them with wood for a more substantial look, but time is running out. While I was at it, I brushed a fresh coat on the mailbox post and erased the front door's "Colonial Red" with beige, too. The rocking chairs will be sprayed the lightest blue (from red) to match the morning glory vines on the mailbox and columns. I eventually decided that the dark red receded the front door and made our brown/beige ranch look even more dated, not to mention clashing horribly with the azalea bushes. Here's hoping a light blue accent will freshen the porch and complement the summer flowers. Are you supposed to be using paint???? ?